The goal of this mod is to add more lenses to the game, that help with empire management and in general quality of life improvements. Currently there are 9 new lenses, but you are welcome to suggest new ones and I can add them. This lens highlights unimproved resources, hills and removable features. This lens auto applies when a builder is selected (can be disabled in the file. See FAQ). Highlights artifacts and shipwrecks. 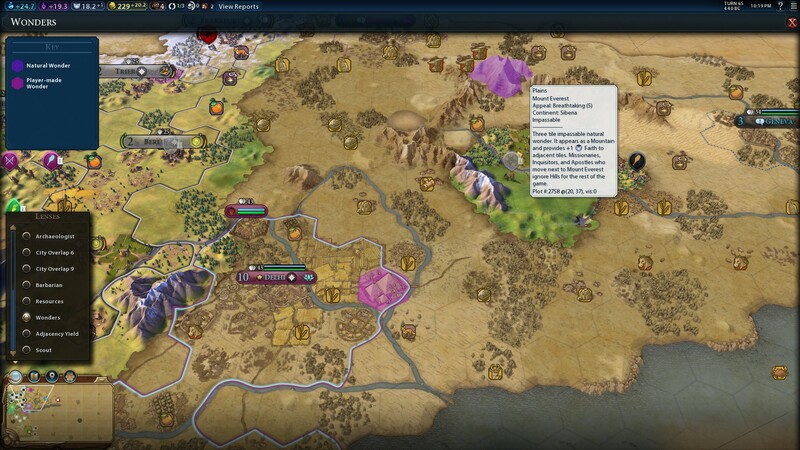 No longer do you need to hunt around the map for antiquity sites. Automatically applies when a archaeologist is selected (can be disabled in the file. See FAQ). Shows how many cities a particular hex overlaps with. Range 6 or 9. This lens will help you find that sweet spot where the maximum amount of cities overlap so you can build that district / wonder. The image below is with range 6. Note the teal spot in the center, that is where you want to place the OP Colosseum. The encampment is on the top left of the map. Highlights resources on the map based on their category (Bonus vs Strategic vs Luxury) and if they are connected or not. A little information overload here. Highlights natural and player made wonders. The wonder on top is Mt. Everest, and below in Delhi are the Pyramids. 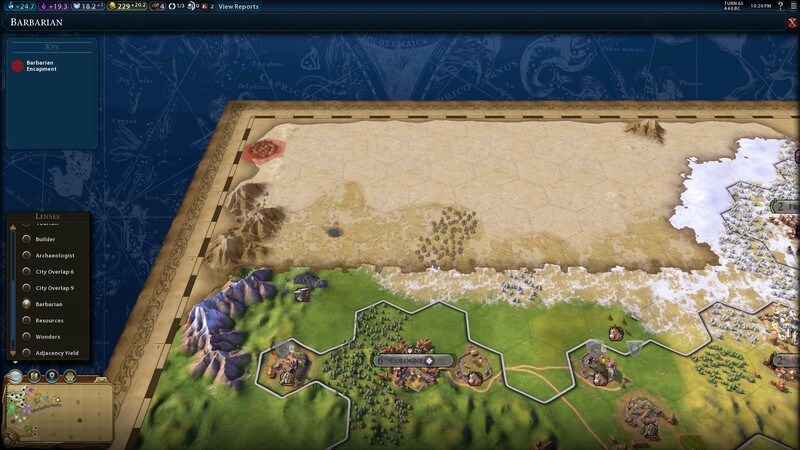 One of the best parts about Civ 6 is the city / district placement. This lens shows the various adjacency bonuses in a gradient, allowing you to relish in your pristine city planning skills. Simple Hansa and Commercial hub combo. Look at those Hansa bonuses! Get the latest version from this page or here if you prefer GitHub. 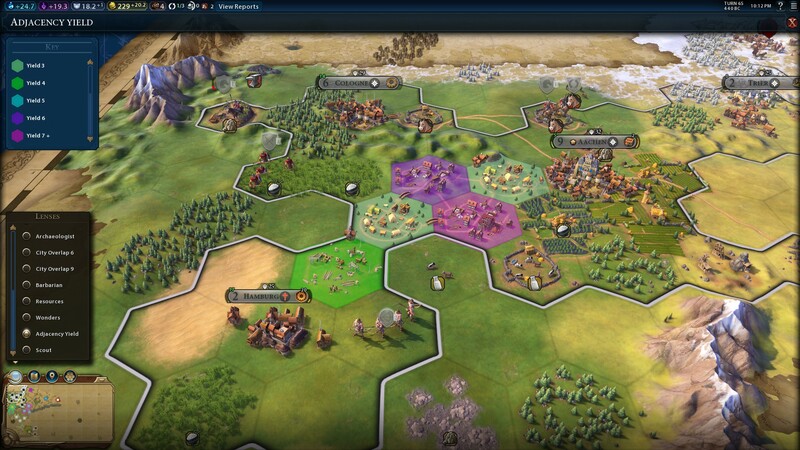 Activate the Mod in Additional Content inside Civilization VI. If you are using CQUI, this mod is already included in the latest nightly and requires no extra installation. If you are running any other mod that changes the following files, my mod will not be compatible. How did you add lenses? There isn't a built-in functionality to add lenses. I went around that by making the game think it is displaying Appeal Lens, but change the hexes being highlighted. Can I change what color is being used? You can find the colors in MoreLenses_Colors.sql. I used the following websites to find the values: website1, website2. 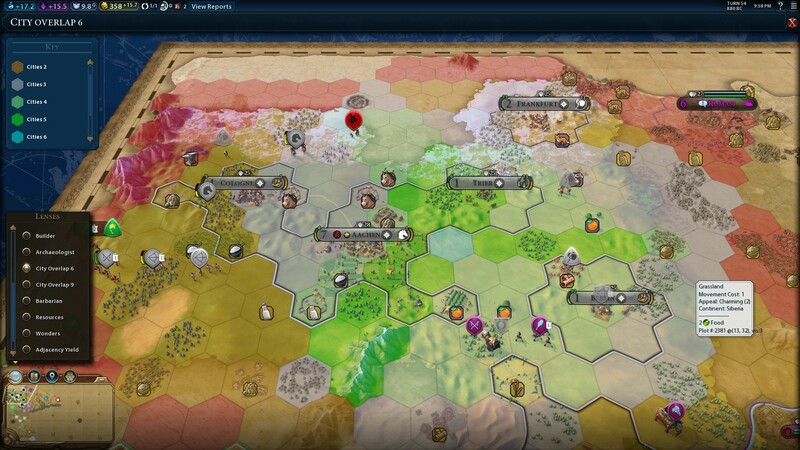 Fair warning, colors on the map will look different from these websites mainly because on a civ 6 map the background to a lens'ed hex is usually a green plot or a blue sea. That mean blue starts to look like purple and all other issues. This was the main reason why I could only get the gradient to 8 distinguishable colors. Can I disable a lens being auto-applied, like the builder lens, archaeologist lens, scout lens? -- Should the builder lens auto apply, when a builder is selected. -- Should the archeologist lens auto apply, when a archeologist is selected. -- Should the scout lens auto apply, when a scout/ranger is selected. Can you dim the hexes to highlight the tile? Previously I posted a image of a lens where hexes irrelevant to the lens were dimmed to help the highlighted plots pop. Unfortunately during my play testing there is an upper limit to the amount of hexes NOT being dimmed (around 63). After this the lens would break and the map would turn black. I have it disabled currently but you can find the commented sections of the code and change that around. Does this mod work with CQUI? CQUI already incorporates this mod, and requires no extra installation. If you encounter issues on reloading (like text not showing up correctly), quit the application (to desktop) and restart. 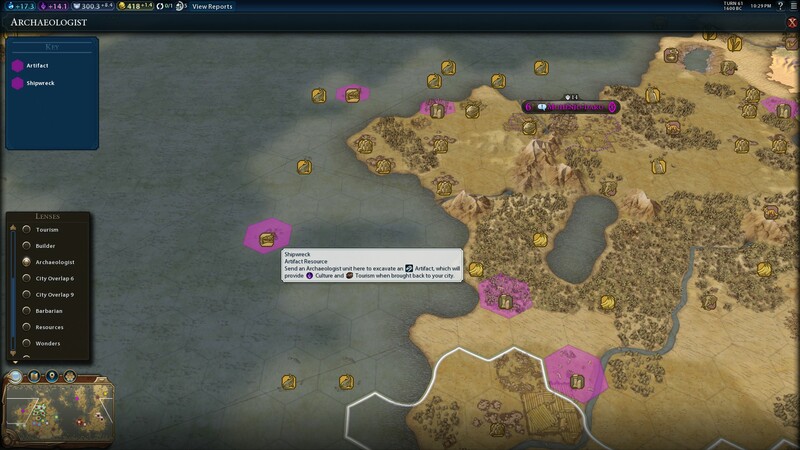 This is a Firaxis bug. For China's UA, the lens does not update until the next turn. This happens because the plot info does not update until the turn change. The way modded lenses are handled (explained below) there could be bugs. If you find one please report them, and I will try to fix them. Quill18 for the idea of the mod and the builder lens. @notque for finding the builder lens bug of highlighting rivers. @Zyxpsilon for suggesting the resource lens. Fixed issue with the builder lens remaining active after using all of his charges. 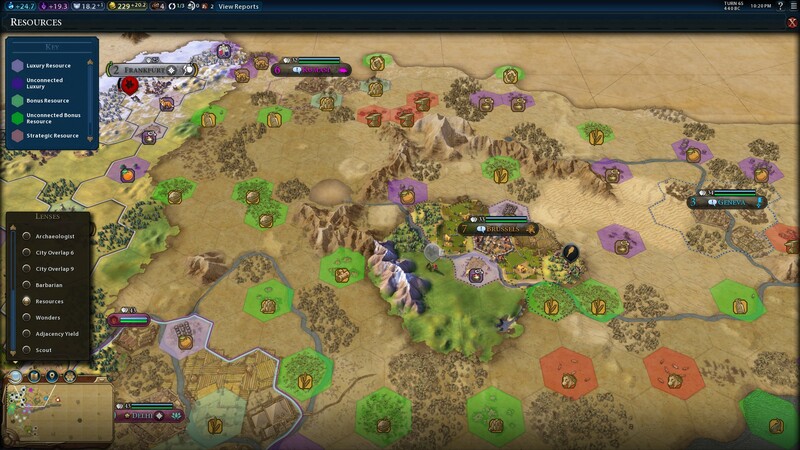 Fixed issue when playing as China, all wonders would show as Dark Green, and not just Ancient and Classical Wonders. Fixed issue when playing in multiplayer, when the builder is captured, the builder lens would remain active. Changed logic how the modded lenses were being displayed to make it less buggy when switching between various lenses. Fixed issue with builder lens not working when building a wonder with no prereq tech. Changed the appearance of builder lens. No longer paints red all over the map. Fixes issue of rivers being visible in undiscovered territory. Highlights unimproved resources with purple. Added Archaeologist Lens: Highlights artifacts and shipwrecks. Auto applies when a archeologist is selected. Added City Overlap 6/9 Lens: Shows how many cities a particular hex overlaps with. Range 6 or 9. Resource Lens: Highlights resources on the map based on their category (Bonus vs Strategic vs Luxury) and if they are connected or not. Wonder Lens: Highlights natural and player made wonders. Barbarian Lens: Highlights barbarian encampments. Adjacency Yield Lens: Shows the different adjacency yields for districts in a gradient. Scout Lens: Highlights goody huts on the map. Auto applies when selecting a scout or a ranger. Added Recommended Feature hex to builder lens that highlights flood plains, forest next to rivers, and plots next to wonders that give bonus yields. Scout lens updates on movement of scout. Fixed issue with the lens not deselecting the radio button when closing the lens legend. Changed color for Archaeologist lens. Red for artifact, Green for Shipwrecks. RohirrimElf and CyberFox like this. This is very convenient for finding luxury resources that I have not yet obtained. Great addition! Now I can find those numerous spawning barbarian camps instead of getting rushed by their riders. Great mod. I love that I can easily see outstanding improvements and where barb camps are. Fabulous. 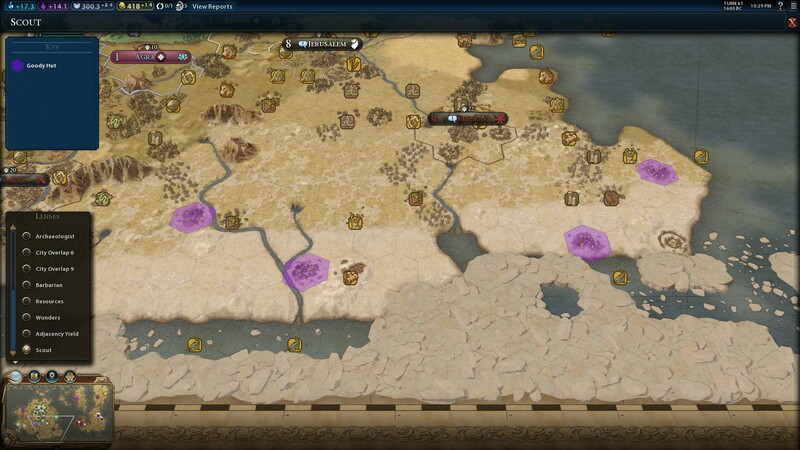 Makes looking for such things as barbarian camps, archaeological sites or new strategic resources very easy. can't see those pesky hills? tired of using map pins to mark all the ruins to excavate? 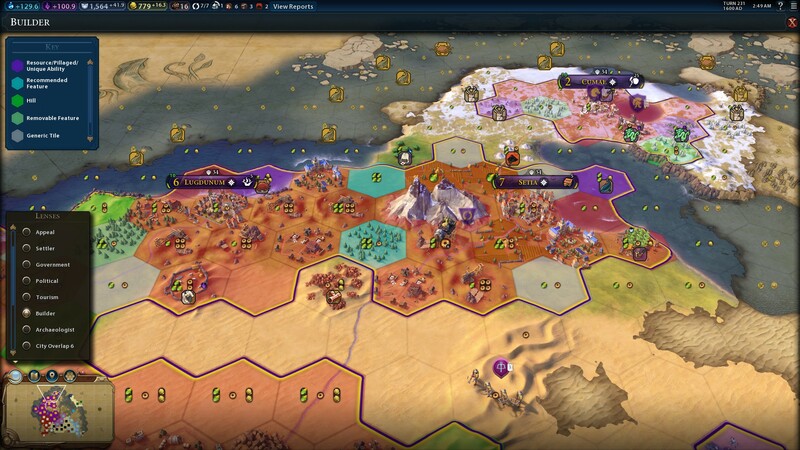 AI just pillaged your whole cities tiles and you can't tell what to fix? than this mod is for you! Adds lens to see ALL that + more. Improves the espionage screens by adding filters, side panels, etc. Some typos and errors in the base game code. Guide to traders, trade routes, and other related information.